Trusting the Process is a 2-part process, and if you follow it precisely, you will never, ever, EVER fail. Create a Grand Plan, a pristine structure, one that celebrates your vision, honors your mission, and expresses your intention perfectly. Exquisitely. Obsess about it. Agonize over it. Do not let one stone go unturned. Polish this Grand Plan until it shines like a disco ball at Studio 54 in 1979. Make it P-E-R-F-E-C-T.
Have the magnificent courage to point at your “perfect” Grand Plan and laugh maniacally at it, because of course you know it has very little to do with what’s actually going to happen. Remember, we are stepping into the realm of POSSIBILITY, after all. Possibility is INFINITE, and that’s not just me saying that. That’s the opinion of the brainiac quantum physicists of the world! When we begin anything new – a creative project, a business venture, a career, a family, or a personal transformation of any kind – we are courageously shifting from our probable course to the path of beautiful, sparkling POSSIBILITY. Our ego doesn’t like this. Not one bit. It’s unknown. It’s scary. It can’t be confidently determined by left-brain calculations on what’s going to happen based on past events, perceived limitations, available resources, and long-held assumptions. So Trusting the Process is about getting out of our comfort zones. Way, way out of our comfort zones. Don’t be surprised if you feel your organs squirming around in your belly. Trusting the Process does not come naturally for most of us. More than anything, Trusting the Process is an exercise in SURRENDERING. Breathe, and Trust the Process. Possibility wants to take you for the ride of your life. Let it! Then, it’s your singular mission to stay in the moment. It’s so important not to get ahead of ourselves! We have unbelievable skills at inventing problems or roadblocks that will likely never, ever happen. Acknowledge the brilliance of these impressive imaginations of ours, then get back to Trusting the Process. Breathing is a great way to anchor any moment that comes your way. Besides, breathing is free, and your breath is always with you. Breathe. Seriously. It works. Managing expectations is our next Herculean undertaking. In the moments we manage to transcend fear and surrender to the idea of a shifting life trajectory, we may see and feel glimpses of visceral POSSIBILITY. This is a bright, beautiful playground of light, love, hope, expansive dreams, soul fulfillment, and an exquisite sense of alignment with our destinies. During these moments, our imagination is liberated from all the baggage that came before us, and we believe! We’re inspired! We can do it all! Ideas flood in. Connections we never saw before suddenly zap together, Matrix-style. Future projects start exploding in our minds. We’re invincible! Unstoppable! It’s all possible! Woohoooooooooo!!!! While these moments are truly, succulently, undeniably AWESOME, we’re still adorable little humans, and 99 times out of 100 they Totally. Freak. Us. Out. Come back to the moment. Breathe. Release expectations, and – you got it – get back to the original job of Trusting the Process. 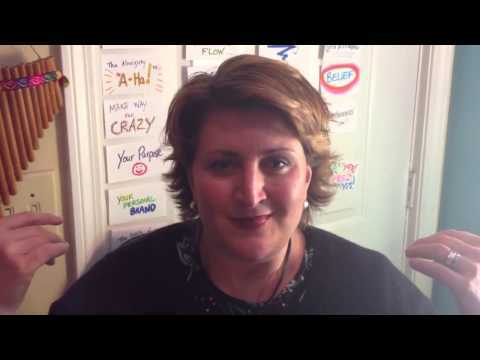 Then you can take whatever action step is next on your unfolding journey into Possibility. A couple years ago I went to an extraordinary and truly unique 4-day retreat at the Kripalu Center for Yoga and Health called “The Inner Quest Intensive,” led by Aruni Nan Futuronsky, Life Coach and Program Advisor for the Kripalu Healthy Living Programs. During this bizarre and wondrous adventure, Aruni kept talking to us about the powerful yogic practice of observing what’s going on without casting judgment on it. This is one of those things that sounds deceptively simple, until you actually try to do it, and you notice just how much your mind chirps opinions and casts judgments of all kinds onto any event or circumstance, no matter how huge or trivial. Turns out our minds love to try to spoil the endings of stories before they even get off the ground! They love to have their say, and rush to conclusions based on old facts and figures, beliefs and biases. As we surrender to the art of Trusting the Process, training our minds to observe without judging is one of the best gifts we can give ourselves during our own pursuit of POSSIBILITY. Did your archenemy get the position you wanted and deserved? Did you fall off a chair lift, twist your knee, tear your ACL, and now need a $20K surgery, just like I did last month? Did you get rejected by a publisher, scorned by a lover, hurt by a friend, audited by the IRS, or criticized by a parent? This ultimately, eventually allows you to slide into the habit of passionately insisting every thing that happens along the way is THE BEST THING EVER. Which, of course, clears the path for you to fall madly in love with and experience the undisputable magic of HAPPY ACCIDENTS. Life is messy, especially as we willingly open up to the ever-expanding world of possibilities! The goal of this whole “31 Days of Possibility” series is to be okay with the fact that we have NO IDEA what could happen next, and that’s the best part. 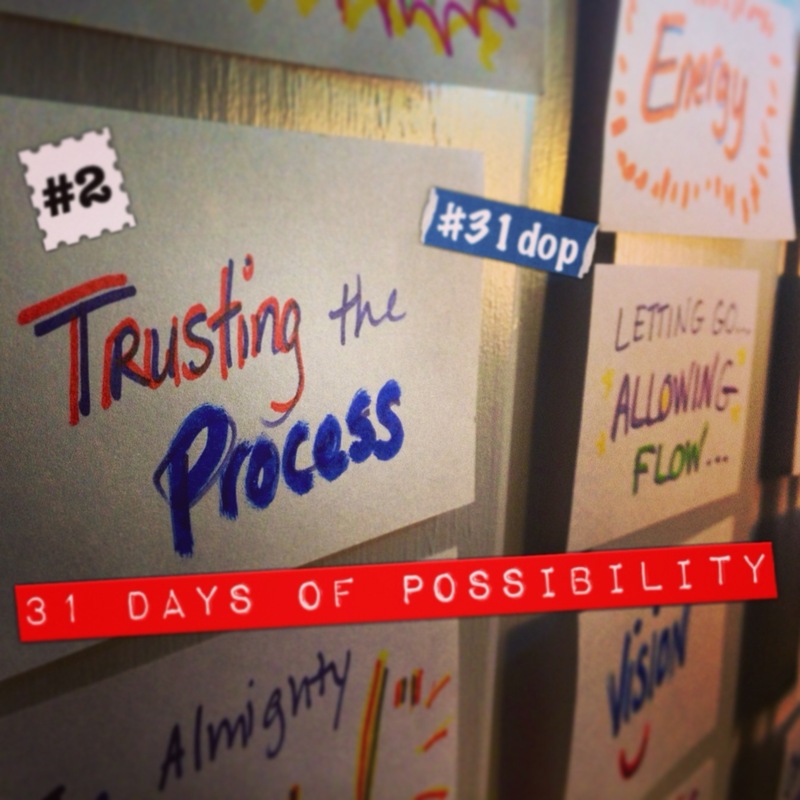 Check out the video for Day 2 of the 31 Days of Possibility: Trusting the Process! 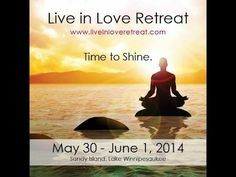 You can find us on Twitter at @LaniVoivod, @AllenVoivod, @EpiphaniesInc, @AhaSummit, @AhaYourself. Plus, you’re always welcome to ask questions, give feedback, and share some of your own experiences (and hopefully your big “A-Ha!” victories along the way), here in the comments, and on the Epiphanies, Inc. Facebook Page. Allen and I love to hear from you. Here’s to you and your vast and wondrous possibilities!